2019 will spell the end of the Ford Taurus in North America, while also marking the end of Ford sedans in the market. But before the last Taurus rolls off the line at the Ford Chicago Assembly Plant, the 2019 Ford Taurus will get a few changes. Calling the changes as such would be a mis-nomer. Instead, we would refer to these “changes” as feature removals. No matter, here’s what’s new. Both are mated to a six-speed automatic transmission. Front-wheel-drive is standard, while all-wheel-drive is optional. The 3.5L EcoBoost engine is mated with all-wheel-drive at all times. 2019 Taurus SEL interior full instrument panel. In addition, the manual tilt and telescoping steering wheel is now standard on all models, since the power tilt/telescoping steering column has been deleted. On Limited models, a leather-wrapped steering wheel is standard, replacing the leather-wrapped wheel with a wood insert. 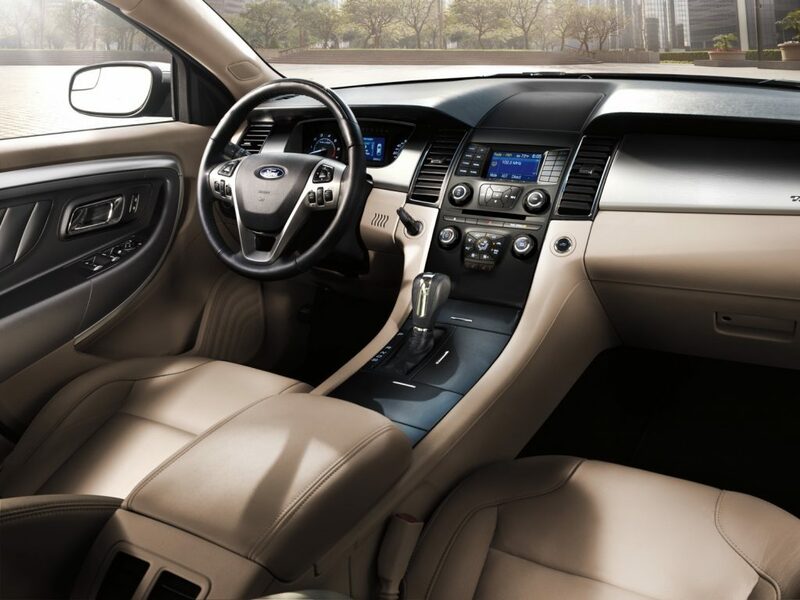 The 2019 Ford Taurus removes the auto-dimming rearview mirror on SEL models, and replaces it with a manually-adjustable day/night unit. No changes are made to the Drive Assist systems. Functionally, the engine block heater (41H) is no longer standard. Instead, it is now optional in cold weather states. Further decontending the 2019 Ford Taurus is the removal of the rear-window power sunshade on Limited and SHO models. No packages have been added or deleted for the 2019 Ford Taurus. And that’s all that’s new for the 2019 Ford Taurus – the last model year of the nameplate in North America as The Blue Oval bails on sedans to sell everyone a van, crossover, SUV or pickup truck. Stay tuned to Ford Authority for ongoing Ford Taurus news coverage. I guess I will hang on to my 2015 LTD Taurus that has everything that Ford deleted on the 2019, I also have which I like very much is the Tuxedo Black Exterior paint. Oh, and the rear window sun shade really cool. before the end of last year, Ford hinted at an upcoming “Four door Mustang” Now i maybe stretching the imagination just a little bit but in the last few years, the term “gran-coupe” has been being tossed around on several “four-door coupes” ranging from the BMW M6, the upcoming BMW M850i, the AMG CLS63, and a few other things while the term coupe has even been used on the AMG GLC63 coupe and the upcoming AMG GLE coupe. Even Audi has the RS5 Sportback which is a 4-door car. I bring these cars up because Ford has a big presence in Europe and Europe has a huge influence on Ford. What i do see happening here is Ford bringing a very mustang-like 4-door gran coupe to the united states with the Mustang powertrain on the new CD6 platform. My personal belief is that the new Mustang (based on what is seen in the Ford Ad “the future is built) will evolve into a car that is similar to the BMW M850i X-drive coupe. Like in the early 70’s when the pony cars all grew to more “mature” vehicles so to speak and everything had a “European” flare to it as even the camaro was likened to a Ferrari design, The mustang will become more of a Grand Touring sports coupe than a true muscle/pony car. The V8 will live on and be more powerful thanks to Ford’s innovation into the hybrid electric world. As far as it’s four-door counterpart, think of the BMW M850i Gran-Coupe. With the CD6 platform being a modular platform, this idea is actually not as far-fetched as some may think. While the ford variants won’t compete directly with the BMW car’s due to pricing, they will be a lower optioned offering to cars like that. As far as this “Mustang inspired crossover” I look at SUV’s like the BMW X6M, the Porsche Cayenne Coupe and even the AMG GLE63. While all of these three will have electric performance variants, They are basically the SUV versions of the former BMW M6, Porsche Panamera V8 and the AMG E63. With Ford, it would be based off the Mustang so it’s design, and hybrid V8 powertrain would be offered on the CD6 platform. lastly for the Explorer, everything about the explorer screams Range Rover Sport and with the new RWD based CD6 platform it rides on, it’s hard for me to imagine that a high performance Explorer 5.0L V8 AWD hybrid setup isn’t on the way to truly take it’s place as the American variant of the Range Rover SVR, just thousands of dollars less expensive. Now, do i think that these vehicles will go toe-to-toe/blow-for-blow with the actually European cars, NO i don’t but will they be a Ford quality alternative to the BMW M850i X-drive coupe, the BMW M850i gran-coupe, the BMW X6M/Porsche Panamera Coupe, and the Range Rover SVR? YES i do. I’m also watching the other things Ford is doing with their lineup. Particular the actual SUV and the Truck lineup. The Ford Ranger is an awesome truck, I’ve seen it in person and even with it’s full boar awesomeness, the cabin space is limited and i believe the next gen ranger (due in 2021 or 22 i believe) will more than likely make up for some of that while keeping it smaller than the F150. I also believe that this platform will spawn not one, but two American Stablemates, the Bronco, which we already know is coming along with the Ford Everest, a popular Australian SUV. The Everest would come in, replacing the Ford Edge while the Bronco will be the contender to the Jeep Wrangler and Wrangler Unlimited. Both vehicles will be rear wheel drive based but where the Everest would be more geared towards suburban and urban life with possibly a wild trak trim level that would be more geared towards off road style and performance, the Bronco would be the off road beast. Slotting under this would be whatever this new “Baby Bronco” SUV is and it would replace the front-wheel drive Escape with a rear wheel drive based AWD setup with a 2.0L Ecoboost engine rated at 275hp and roughly around 300lb-ft of torque. The Everest, Bronco, and Ranger would have the 2.3L Ecoboost pushing 350hp/350tq with an optional 3.0L V6 non-hybrid 400hp/400tq twin turbo setup. Rounding out the SUV lineup would be the F150 based Expedition which i believe will dump the 3.5L twin turbo setup for the hybrid 5.0L V8 setup that will be in the F150 and receive a few different packages such as a black sport package, a better King Ranch package, a limited package and (here’s hoping) a Harley Davidson package. We all know the new F150 is coming (just like the new Toyota Tundra) and It’s about time the Ford Lightning made it’s return. We know that Ram is cooking up a Hellcat powered 1500 so why not a supercharged 620hp Variant of the 5.2L V8 that powers the GT500 with a 10-speed auto and an AWD setup for the street? Not to mention a hybrid 5.0L Harley Davidson V8 pickup, a 5.0L Lariat Classic (two-tone) pickup with an FX4 off road package that includes a 3″ lift, 33 all terrain tires and a few other trail rated goodies (basically a non-raptor trail pickup that is still a truck). Of course the raptor would still be around but there is a much broader spectrum out there to accommodate that want something more exciting than a silly dune-jumping V6 twin turbo raptor. There are some of us out there that miss the 6.2L Raptor and long for it’s return. At this point, a coyote Derived 5.4L V8 powered pickup truck would be awesome, and actually not a bad idea. With the technology used in the 5.0L V8, the 5.4L V8 would still be smaller than GM’s 6.2L or Mopar’s 5.7L Hemi but would be more powerful than either and be a step above the 5.0L and would still be just as simple to work on without turbos or anything else to maintain. Lastly, Ford’s super Duty pickup truck will be receiving not only the 7-Liter gasoline V8 but also Ford Will be releasing a Power Wagon fighting Ford F250 High-Boy. While I’m sure the 7-liter V8 will be just fine, Ford will need to upgrade the Powerstroke V8 to produce 1100lb-ft of torque to combat the new Cummins 6.7L diesel. Of course, Ford will have their full EV line plus their commercial line including the new new Ford Courier. I have a feeling that the Transit Connect will probably become a fully electric vehicle within the next two years like most of Ford’s Commercial and police force. I’m also fairly sure that GM will go down this same road within the next few years, reducing their large displacement V8 small blocks into more technical 5.0L and 5.7L DOHC V8 engines, offering up 10-speed hybrid transmissions and 7-speed DCT units, going down to three platforms (VSS-R, VSS-S and VSS-T) platforms along with their commercial and military vehicles. With GM, however, I see them taking more of the Mercedes Benz approach to things, with a much more aggressive lineup of vehicles where as Ford will appeal to more of the BMW/Audi crowd with a smoother, more balanced approached while still offering massive V8 power. Another thing i’m thinking is that Ford may drop the V8 displacement down to something that still has a high performance history, the 289ci V8. All of this to say, I don’t think that V8 performance will be leaving ford anytime soon and I do believe that ford will still have a sedan-like option based on certain rumors and other tidbits of info flying around. In about 20-years or so, yeah, electric vehicles may have fully taken over the auto world, I give it another 10 years before V8 cars die off being replaced fully by twin turbo V6 hybrids. By then, most or all of us die hard high performance guys will be gone anyway and the world will be taken over by the growing population of people who will have devices attached to their bodies so that they can constantly be fed live social media feeds even while they are sleep and will live in high rise buildings where the lobbies have nothing but whole foods, panera bread and starbucks coffee. They’ll ride monorails and zoom around in automated pods and all kinds of stuff like that. All of us old folks who drink Wawa, Dunkin Donuts or 7-11 coffee, eat from Wendy’s & Burger king, drink beer, shoot guns, and all the other normal stuff will be in senior homes or dead and gone by then anyway so it’ll be okay. Thanks for the update, I only wish Ford Stock would reach the same stock price when I was working there in 87. Is there a similar article on what’s new for the 2019 Fusion?